The Transregional Center for Democratic Studies (TCDS) at the New School for Social Research (NSSR) is happy to invite the New School community, as well as our alumni and friends, to join us for pierogi and wine at the Wolff Conference Room, on Monday, February 11th, 2019, as we welcome this years cohort of Global Dialogues Fellows! 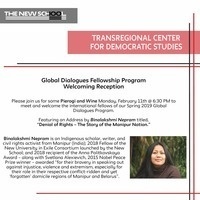 The evening will feature a lecture by activist, scholar, and 2018 New University in Exile Consortium Fellow Binalakshmi Nepram titled, "Denial of Rights - The Story of the Manipur Nation." We look forward to seeing you all there!